In June 1968, Maccabi Tel Aviv took the league title in Israel. It wasn’t their best season in history by a long shot. In 1954 and 1958 for example, they hadn’t lost a match the whole season, while this time around they lost more than ten. This title was special for different reasons: starting in September 1966 and ending 21 months later it was one of the most time-consuming leagues in history. Maccabi Tel Aviv had to play no less than 60 matches to claim it. In the summer of 1966 things got very tense in the Israeli soccer world. There was (too) much rivalry between the Hapoel-teams and the Maccabi-teams, causing riots on the field and rumors of match fixing. On top of that, the Israeli FA wasn’t pleased with the level of play. They made a drastic decision: the league would continue for two years with every of the sixteen clubs playing each other four times. By taking away the immediate threat of relegation for a year, they expected clubs to be more inclined to incorporate youth players in their team. Concerned about the match fixing, they also decided to let the Hapoel-teams (five in the league) and Maccabi-teams (seven in the league) start the season playing each other, and repeated that at the start of the second part of the season. This way it was impossible that two teams with the same ‘background’ would meet in the league-deciding closing matches. Maccabi Tel Aviv at first seemed to be a victim of this rule. They got off on a very bumpy ride against their fellow Maccabi-teams, drawing four of their first six matches and losing the other two. But then things got much better. Starting with a 5-0 win over Maccabi Netanya on November 12, 1966 (goals from Giyora Shpigel (2), Moshe Asis (2) and Eli Sandler), Maccabi Tel Aviv won nine times and only shared the points twice in eleven consecutive matches. Especially Rachamim Talbi was on a roll, scoring almost every match. At the end of May 1967, Maccabi Tel Aviv had played 26 matches and collected 35 points, with most goals coming from Rachamim Talbi (12), Giyora Shpigel (11) and Moshe Asis (6). Shpigel (also known as Giora Spiegel) of course later had a great career abroad, playing for Olympique Lyon and Racing Strasbourg in France. Then the Six Day War early June 1967 prevented the league from continuing. As a result, the last four matches had to be played before the official start of the second part of this two-year experiment. The yellow and blues of Maccabi Tel Aviv had a worse second part in this marathon. Only three times they scored more than two goals, and with a record of fifteen wins, eight draws and seven losses, at the end they stayed just three point ahead of Hapoel Petach Tikva. On match day 58, June 8th 1968, their home win against their rivals proved decisive. In front of 8,000 spectators at the Hammacabia stadium coach Israel Halivner sent these eleven Maccabi-players onto the field: Levin, Karako, Rozen, Belo, Gershovish, Asis, Bachar, Shikva, Shpigel, Talbi and Bar Nur. In the end, Dror Bar Nur scored in the 64th and 89th minute, securing Maccabi a 2-0 victory over Hapoel Petah Tikva. While Maccabi Tel Aviv deserved the title as a team, Mordechai Spiegler of Maccabi Netanya was Player of the Year, although this time not official. 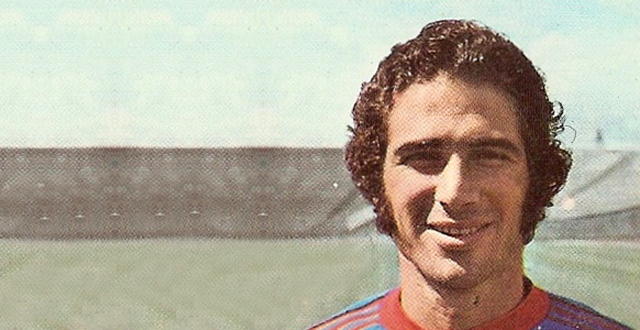 Spiegler (born July 27, 1947) was already awarded the title the previous season, and would win it again in 1969, 1970 and 1971. During the 1966-68 season the striker scored a total of 38 goals (15 goals in the first part, 23 in the second). 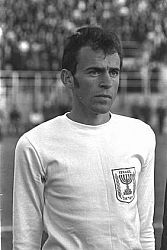 He also was the national top goalscorer in 1966 (together with Moshe Romano on 17 goals), and 1969 (25 goals), so Spiegler was not new to acquiring trophies. A few years later Spiegler went to France to play for Paris FC and Paris Saint Germain, ending his adventure at New York Cosmos in the American NASL. By clinching the title, Maccabi Tel Aviv got a treat for the year ahead: they were allowed to take part in the second ever Asian Champions Cup. Rival Hapoel Petach Tikva had won the first edition in 1967, so Maccabi was compelled to perform well. And so they did, in January 1969 in Bangkok. While Giyora Shpigel was undoubtedly the man of the tournament, scoring six times, it was again Dror Bar Nur who made the all important goal in the final. After this success, Maccabi Tel Aviv also won the 1971 edition of the Asian Champions Cup. They didn’t need to play the final, as Iraqi club Al Shourta withdrew from the match and the Cup wasn’t played again for fifteen years. It became increasingly difficult to get Islamic clubs to compete against the Israeli clubs. Ultimately it was set-backs like these, that forced the FIFA and UEFA to put the Israeli national team and their clubs into the European zone. 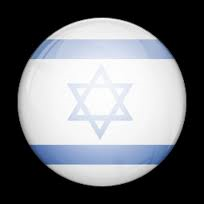 The fierce opposition from Europe certainly raised the level of play in Israel. At the same time, it transformed Israel from a prominent soccer country in Asia, into a mediocre European competitor, with the odds of winning new prizes and playing on the world stage at a minimum. Playing against Asian opposition the national team won the Asian Cup in 1964, qualified for the Olympic Games in 1968 and 1976, and even got to compete at the World Cup in 1970, in Mexico. Of course this theory could be easily proven wrong if Israel would qualify for the World Cup in Brazil in 2014, which at the moment is not impossible at all.